Through exploring in turn the Father, the Son, and the Holy Spirit, Calvin's Institutes sought to achieve a "knowledge of ourselves" in light of "knowledge of God". This work, foundational to theological thought for five centuries, is presented here in a faithfully edited version - perfect for enriching Bible Studies or devotionals. 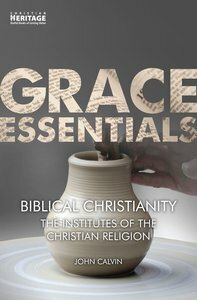 About "Biblical Christianity - the Institutes of the Christian Religion (Grace Essentials Series)"